SEA COWS BAY, Tortola, VI – Hon Julian Fraser RA, a District 3 representative formerly with the Virgin Islands Party (VIP) but now Chairman of Progressives United (PU)—a party he founded—is lashing out at a major political scandal that occurred over the last six months in the Virgin Islands (VI). 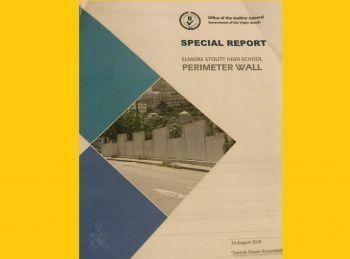 Mr Fraser was at the time speaking at a PU prep rally on Monday, February 4, 2019, in District 3, Sea Cows Bay, when he indirectly referenced the 1.6M Elmore Stoutt High School (ESHS) wall scandal connected to National Democratic Party’s (NDP 1) Chairman, Hon Myron V. Walwyn (AL) and the slothfulness of the audit into the project by Auditor General (AG) Ms Sonia M. Webster. “I’m in politics, I’ve been there for a while, and to be honest with you, sometimes I’m ashamed to be labelled a politician because of what it stands for over the years,” Hon Fraser told those gathered at the rally. “I see the Governor [John S. Duncan] ordered an audit of a project… that Governor left the country and the audit wasn’t completed. Another Governor [Augustus J. U. Jaspert] came a claimed that it was going to be completed. That audit was completed and it barely made it to the House of Assembly (HoA)… Barely,” he said in reference to the ESHS Wall Audit Report by AG Ms Webster. “It hit the streets before it made the House of Assembly, unheard of… these are the kind of things that render an individual to be fired but because there is no credibility, noting was done,” he said in reference to the entire debacle where the report was leaked to the media by Mr Walwyn himself, ahead of it reaching the HoA. “There’s going to come a time when some of our politicians will end up in jail just like in America, It’s got to happen… that same project that the Governor ordered the audit on… he said he gave the audit to the police. Well, when you give something to the police that means there’s criminal intent somewhere in it and the potential for an indictment exists,” the PU Chairman said. “And this is the kind of thing that you want in your country?” he questioned the audience gathered, “and you [are] asking people to serve themselves up to be candidates,” Mr Fraser further juxtaposed. “I went around and I’ve been talking to people who are uniquely qualified to do a good job in this country and what you get instead, is people who are afraid to get involved,” he said. Well after this election you would no longer be associated with politics because you would have been voted out. The wall was bad enough. What about the two brand new buildings at the same school that the hurricanes mash up and they had to tear down? Were they done with cardboard? Don't we get value for money anymore? Sometimes a Politician must recall that it was the Peoples Votes put them in their for the benefit of The People as a Whole! When a Politician forgets and get sideline by biases and corruption, these deeds will forever taunt you! NDP really getting away with alot of corruption. This is not good.